Bile is a substance produced in the liver and stored in the gallbladder, before being secreted into the intestines during the digstive process. The primary constituents of bile are the bile acids cholic acid and chenodeoxycholic acid, and their salts. The main function of bile is to emulsify fats consumed in the diet to facilitate their absorption and utilisation by the body. Bile also constitutes a major route of elimination for substances detoxified or inactivated by the liver. Nutritional supplements are available supplying either whole bovine bile concentrate or extracts containing the active bile acids/salts and are often used to support the digestion of fats. As a result of IBS and contributing gut issues including small intestinal bacterial overgrowth (SIBO) and fungal overgrowth, I have suffered for many years from poor bile flow and poor digestion and absorption of fats. A classic indicator being an 'oil slick' on the toilet water after bowel movements. This has also been confirmed by a number of stool analyses however. In an effort to help the situation I have tried various dietary changes and supplements and have given bile acid formulas a good go on more than one occasion. I notice a modest improvement in fat digestion and absorption but signs and symptoms still persist. 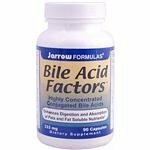 Many people report finding bile supplements very helpful but in my case I derive much greater benefit from herbs that stimulate bile production by the liver (choleretics) and its secretion from the gallbladder(cholagogues). These herbs include dandelion, artichoke, Chinese bitters and Tribulus terrestris. For me these herbs improve fat metabolism, reduce abdominal discomfort and produce a healthier coloured stool. Also, these herbs are generally cheaper than bile supplements.